North Korea’s vast prison camps house tens of thousands in complexes larger than Manhattan where starvation is routine and public executions can be common, according to a recent report from the U.S. Department of State. The State Department released an update on its list of “kwan-li-so,” also known as political prison camps, one of a number of different types of detention centers maintained by the North Korean regime. Many of the camps are several square miles in size. The largest, Yodok political prison camp, also known as Camp 15, covers more area than Las Vegas. The camps can house tens of thousands of prisoners, including family members of prisoners who are punished for up to three generations though they committed no crime. Those that do commit crimes, according to former prison detainees, are often just people who tried to leave North Korea. The State Department gave a breakdown on several of the camps, including the Kaechon political prison camp, which is approximately 60 square miles in area and holds 15,000 prisoners. All the prisoners there are serving life sentences, though the general population is segregated from prisoners considered “enemies of the state” and “unredeemable.” Those prisoners have committed political crimes and are punished “through unending hard labor,” reads the State Department’s fact sheet. “Those sent to the camp include officials perceived to have performed poorly in their job, people who have criticized the regime, and anyone suspected of engaging in anti-government activities,” it reads. Not all prison camps are the same as Kaechon, which the State Department describes as “one large total control zone” because all prisoners are serving life sentences. Prisoners in the camp work as slave labor doing work that includes mining, farming, and raising livestock. “Induced starvation is common among prisoners, who are driven to catch and eat rodents, frogs, and snakes,” reads the report. Other camps, like the much smaller Chongjin political prison camp (Camp 25), which covers 247 acres, do not contain prisoners’ family members. Very little is known about total control zone Camp No. 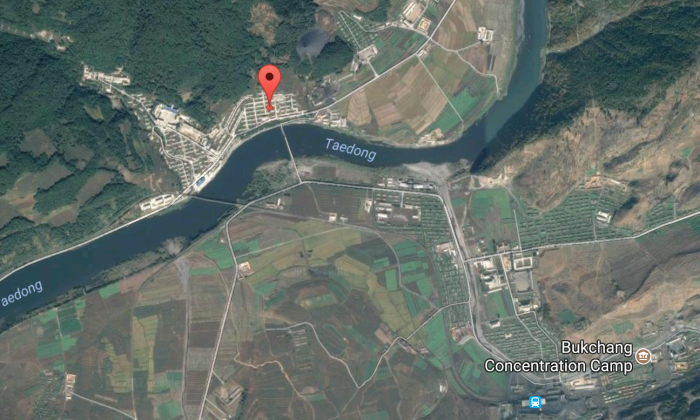 16, the Hwasong political prison camp located about 240 miles northeast of capital city, Pyongyang. No former prisoners or camp officials have ever testifed about the camp though local residents said it has three sections for prisoners whose crimes differ in severity. South Korea’s National Human Rights Commission estimates there are approximately 20,000 prisoners at the camp. Satellite images indicate the camp grew in 2012 and NGOs report that prisoners from Camp 22, the Hoeryong political prison camp, which housed 50,000 prisoners at its peak in the 1990s were moved to Camp 16. “Public executions were held weekly in the camp until the 1990s, when camp administrators, allegedly fearing riots, moved the executions to a secret site known as ‘Sugol,” reads the State Department’s report. Ahn recalled his shock upon first arriving at the camp in testimony on the conditions there. He likened the prisoners to walking skeletons, “dwarfs,” and “cripples” in rags. “He estimated that between 1,500 and 2,000 prisoners, mostly children, died annually of malnutrition during his years there. Ahn also described brutal abuses committed in the camp’s punishment chamber, which another former guard has described as ‘a prison inside the prison,'” describes the State Department. The report summarizes grim conditions of North Korea’s known political prisons through testimony given by former prisoners who have managed to escape North Korea, as well as secondary testimony combined with satellite-imagery and NGO-obtained information. Hopes that the situation in North Korea could change under it’s new, younger, leader have been dashed. According to Human Rights Watch, North Korea remains one of the most repressive authoritarian states in the world. “During his fifth year in power, Kim Jong Un continued to generate fearful obedience by using public executions, arbitrary detention, and forced labor,” noted the NGO.